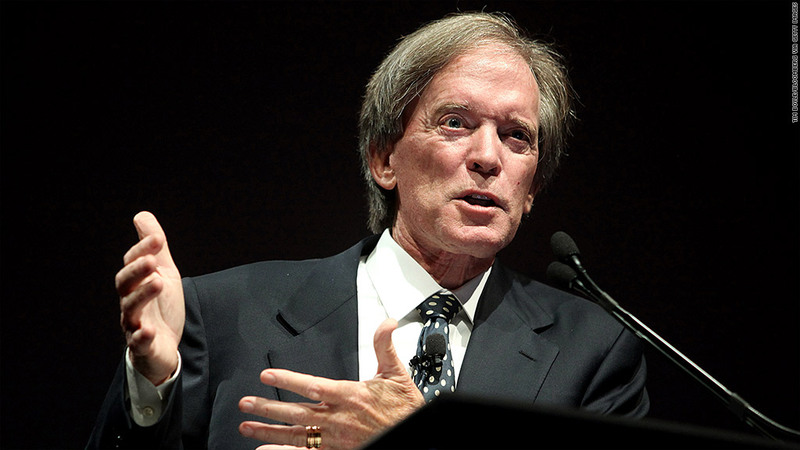 Bill Gross: Get used to low rates "for decades to come"
The Federal Reserve may be planning to begin raising rates as early as 2015, but bond king Bill Gross expects the central bank's interest rates will stay low for a "long, long time." Ben Bernanke has stressed that the Federal Reserve probably won't raise interest rates until 2015, but bond king Bill Gross predicts that ultra-low rates will be around much longer. "The United States (and global economy) may have to get used to financially repressive -- and therefore low policy rates -- for decades to come," wrote Gross, co-founder of investment firm Pimco and manager of the $250 billion Pimco Total Return (PTTRX) bond fund, in his latest monthly outlook. The Fed has been holding its benchmark interest between zero and 0.25% since December 2008. The central bank has said it will keep rates low until the unemployment rate falls to around 6.5%, -- as long as inflation doesn't accelerate beyond 2.5% a year. Though the Fed's own forecasts call for the jobless rate to possibly fall as low as 6.5% next year, most Fed officials expect they'll keep interest rates near zero until 2015. By the end of 2015, Fed members expect a 2% federal funds rate. But Gross thinks investors should "bet against that" happening. "If you want to trust one thing and one things only, trust that once QE is gone and the policy rate becomes the focus, the fed funds will then stay lower than expected for a long, long time," he said. Why will rates stay low for the foreseeable future? Gross says just look at the past few months, which show the economy is still not ready for higher rates. The 10-year Treasury yield spiked from 1.6% to near 3% in the span of four months on the chance the Fed was going to begin to taper, or cut back on its $85 billion in monthly bond purchases. That pushed up mortgage rates, which is weighing on housing starts and mortgage refinancing activity. "The economy peeked its head out its hole like a groundhog on its special day and decided to go back inside for another metaphorical six weeks," wrote Gross. "No spring or summer in sight at those yields." Gross said bond investors should be approaching the market "like a totally hyena-aware lion club -- know there's bad things that can happen out there in the jungle, but for now enjoying the all clear silence of the African plain." He favors Treasury inflation-protected securities and shorter-dated bonds. That kind of portfolio could return 4% a year, he said. But he's been saying that for a while. And Gross hasn't had the best luck this year. Returns on his flagship Total Return bond fund are down about 2% in 2013, and investors yanked more than $5 billion out of the fund in September. That marks the fifth consecutive month of outflows, and bring the year's total outflows to almost $30 billion.